The best performances by athletes, musicians and politicians are always in the last minute. Today is no exception, with UK May securing a concession from the EU giving teeth to the backstop. The problem is this may not win her plan enough votes in Parliament later today. The game theory of the EU is that their concession is just preparation for an extension as a failure in the UK means either a delay or another referendum or a new election and so another set of negotiations. While the rest of the world may look upon this will a smirk and a bit of schadenfreude, the effect of the political uncertainty on global economics isn’t zero. That gets us back to the other last-minute discussions between US and China on trade where no news is good news. This sense of calm won’t last as both the UK and China have a broken clock. The deadlines for good outcomes have long passed with damage control and containment the best result. Lost potential growth and investment could bounce back but that is the stuff of hope rather than reality as all parties from the US to China, UK to Germany have suffered in the one-two punch of tariffs and Brexit. Supply chains take years to build to efficiency and seconds to break, the lack of productivity and threat of inflation that follows could bring a different kind of stagflation to markets. All that brings out the economic data from last night and just ahead – with US CPI looking more important because of it all. The weakness in the Australian economy continues to show in business confidence, housing lending and in RBA speeches. The bounce back in UK data from a horrible December isn’t enough to matter to the bigger political clouds over Brexit. Economics don’t yet trump politics. The USD maybe the best example for measuring this all – even better than the noise of the GBP as markets could be fooled by the broken clock of Parliamentary votes and can-kicking decisions to latter down the road. 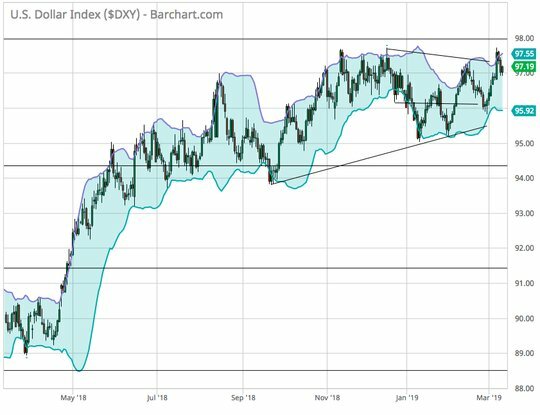 The USD looks vulnerable to a larger downside test should inflation and politics allow more FOMC patience or less time for US/China deals. Question for the Day: Does the US budget matter to markets? The White House $4.7trn budget caught headlines yesterday but is seen by many as dead in the water and more a symbol of the broad divide between Trump and Congress. The focus of the market maybe more on the US deficit and US funding costs – given the auctions today and the risk mood in equities leaving bonds looking expensive. 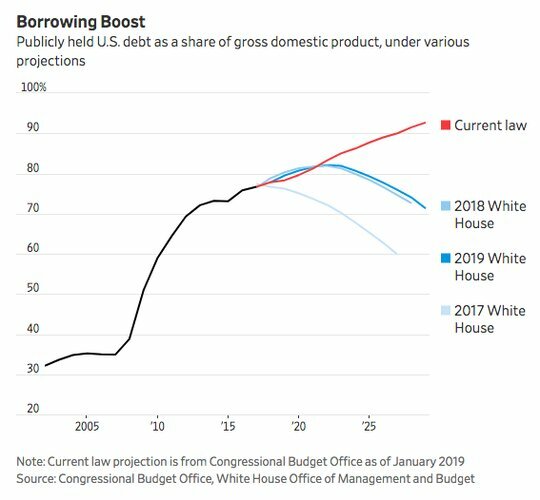 The other part of the budget that catches attention for investors is the weaker revenue projections from the White House. Some of the larger deficit in the US is because of spending, but half is because revenues aren’t what they expected. The Trump team’s revisions from 2017 come to $2 trn. What really matters is the tipping point of confidence for debt where sustainability becomes unbelievable. That rests less on US politics and more on the comparison to alternatives abroad.